It simply should not have taken six years for Gary Carter to get into the Hall of Fame. He was one of the best catchers of his era, and many observers put him in the top ten in major-league history. He was an outstanding defender with a strong arm who did all the other things expected of a receiver. He combined that with a powerful bat – Carter’s 298 homers as a catcher are sixth-most at that position – and a gung-ho competitive spirit. A broad grin and pumping fist were The Kid’s visual trademarks. Knee injuries ground Carter down – in part because he always wanted to stay in the lineup. His last season as a full-time regular came at age 34 in 1988, though he hung on for four more years. Subsequently, he stayed involved in baseball as a broadcaster with the Florida Marlins and Expos. He then coached and managed in the minors, independent ball, and college, but his hopes of returning to the majors went unfulfilled. Alas, Carter also died in 2012 at the too-young age of 57. For the definitive account of this man’s youth and family background, one must turn to Before the Glory (2007), by Billy Staples and Rich Herschlag. All the details one could want are in Carter’s chapter, as told by The Kid himself. Of necessity, this story offers only a tiny selection. Inge Charlotte Keller was born in Chicago in 1929. Her parents were German immigrants who came to the U.S. in the 1920s. Gary later attributed his athletic ability to Inge, a champion swimmer, although Gary himself said, “Funnily enough, I’m a terrible swimmer.”3 His older brother Gordon was also good enough to be a second-round draft pick of the California Angels in 1968 and the San Francisco Giants in 1971. Gordy played two years of Class A ball (1972-73) in the Giants organization. Gary Carter started playing Little League at age six, but he also loved and was talented at football. In 1961, the National Football League sponsored the first Punt, Pass & Kick contest. At the Los Angeles Coliseum, seven-year-old Gary became the national champion in his age group. He was a finalist again two years later, but lost in sub-zero conditions in Chicago. When Carter was 12 years old, his mother died at age 37 after a battle with leukemia. This crushing loss at a young age was at the root of Carter’s later charitable work, raising funds for leukemia research and on behalf of children with other disorders. Jim Carter took on the role of both parents, making great sacrifices for his boys. In addition to his job in procurement for McDonnell Douglas, another aerospace/defense company, he coached Gary at various levels of youth baseball and supported him in all his sporting endeavors.4 Brother Gordy was also a mentor and role model for Gary. Although Carter was totally raw as a receiver, his ascent through the minors was rapid. He played in rookie league and Class A in 1972 and jumped to Double A for 1973. He got his first promotion to Triple A at the end of ’73 and needed just one more year at that level in 1974, when he became the Topps Triple-A All-Star catcher. He never returned to the minors except for a brief injury-rehab stint in 1989. Carter started that winter in Instructional League, but a month into the Puerto Rican season, Caguas needed a backup catcher. Montreal’s general manager, Jim Fanning, recommended the 19-year-old, who became the youngest member of the Criollos. He got a chance to play when the regular catcher, Jim Essian, got hurt. As was true everywhere Carter played, the fans loved him for his enthusiasm and desire to win.15 In the Caribbean Series, Carter hit a homer off Pedro Borbón of the Dominican Republic and was named the catcher on the series all-star team. The Expos called Carter up to the majors for the first time in September 1974. He made his debut at Montreal’s old Jarry Park on September 16. On September 28, also at Jarry, he hit his first of 324 regular-season homers in the majors. It came against a great pitcher, Philadelphia’s Steve Carlton. In 27 at-bats, Carter got 11 hits for a .407 average. Carter wore uniform number 57 in that brief appearance. The following season, Carter was assigned the number 8, and considered it fate. “I was born on April 8. I got married on February 8. We moved into our first home in California on November 8. And look at all the great players who wore No. 8. Carl Yastrzemski. Willie Stargell. Yogi Berra. Bill Dickey. Joe Morgan. Cal Ripken, Jr. All Hall of Famers. So when I was assigned No. 8, I remembered all those things and figured it would be a lucky number for me, and it was,” Carter wrote in 2008.16 He wore it for the rest of his career. The Criollos made it to the league finals once more, and had they repeated as champions, the resulting trip to the Caribbean Series would have endangered Carter’s wedding date. The Bayamón Vaqueros won in seven games, though – and so, on February 8, 1975, Carter married his high school sweetheart, Sandra “Sandy” Lahm.18 At the time, Sandy was training to be a flight attendant. The couple spent their honeymoon in the Expos’ training camp at Daytona Beach!19 They later had three children: Christina (“Christy”), Kimberly (“Kimmy”), and Douglas James (“D.J.”). In March 1975, sportswriter Brad Willson of the Daytona Beach News-Journal wrote a spring-training feature about Carter and his enormous promise. He quoted Karl Kuehl, who had managed Carter in the minors and in Instructional League, as well as Jean-Pierre Roy, the Montreal native and former Brooklyn Dodger who later went into broadcasting with the Expos. They both gave glowing assessments – but what mattered even more were the opinions of Fanning and manager Gene Mauch. Carter finished second in the voting for National League Rookie of the Year in 1975 behind San Francisco Giant pitcher John “The Count” Montefusco. He was also named to his first of 11 All-Star teams. That year, however, he started 80 games in right field and only 56 behind the plate. Carter and Barry Foote continued to share the catching duties for Montreal in 1976, though Carter missed most of June and July after breaking his thumb in a “spectacularly ugly” outfield collision with Pepe Mangual.21 It was his worst season in Montreal. The Expos had a new young star in right field: Ellis Valentine, who had power and a cannon arm. Carter seized the catching job from Foote in 1977. 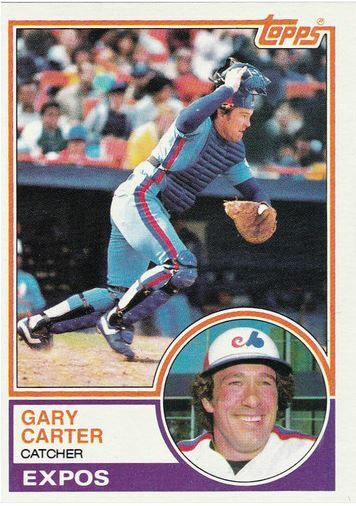 From then through 1984, he started 89% of the games that Montreal played and posted an OPS of .823 (simple averages of seasonal statistics are distorted by the strike of 1981). He won three Gold Gloves in succession from 1980 through 1982 and was runner-up to Mike Schmidt for the NL’s Most Valuable Player award in 1980. His Wins Above Replacement (WAR) numbers were consistently high. At the plate, Carter was an imposing figure. Players were not nearly as bulked up in that era, and Carter had one of the burlier upper bodies in the game then. He gave the impression of using his upper half and especially his forearms when he swung – it was a chopping horizontal stroke, like a lumberjack attacking a tree. He stood up almost straight at the plate, with just a slight knee bend; he held his bat high and nearly vertical. The Expos became one of the better teams in the National League in the late 1970s, thanks to Carter, Parrish, Valentine, André Dawson, pitcher Steve Rogers and other members of a homegrown core. In 1981, they made it to the postseason for the only time in the franchise’s history. Carter was 8 for 19 with two homers as Montreal beat the Phillies in five games in the NL Division Series. He was 7 for 16 in the NL Championship series against the Dodgers, and drew a walk in the bottom of the ninth after Rick Monday’s homer had put L.A. ahead. The Expos could not get the tying run in, though, and their chance for a pennant was gone. They fell back to third place in 1982, despite another strong year from their catcher. Indeed, Carter had fallen off with the bat while battling assorted injuries. He bounced back in 1984, but Montreal still finished fifth in the NL East. The club decided it was time to reload and get value for their star. (John McHale also said that Carter wanted out, though Carter denied that he broached the idea.27) That December, after lengthy talks, the Expos traded the catcher to the Mets. They got four players in return: infielder Hubie Brooks, catcher Mike Fitzgerald, outfielder Herm Winningham, and pitcher Floyd Youmans. Brooks moved to shortstop and gave the Expos some solid (if not huge) years. Fitzgerald was a good defender, though not a big hitter, whose career was spoiled by a badly broken finger in 1986. Perhaps the biggest setback for Montreal was the talented Youmans, who developed arm and substance abuse problems. Carter was back on a home field with natural grass at New York’s Shea Stadium, which helped ease his main physical concern. In a 2010 interview, he referred to “that god-awful Olympic Stadium [in Montreal] that tore our knees up, ’cause I’ve had 12 knee surgeries and both my knees replaced.”30 Torn cartilage was a concern in mid-1985, but he gutted it out with a brace and waited until the season was over before getting arthroscopic surgery. The Mets could not overtake the St. Louis Cardinals in 1985, but ran away with the NL East in 1986. Carter had his last truly big year, remaining a near-constant in the lineup except for a two-week stretch on the sidelines in August. (He hurt his thumb diving for a ball during one of his occasional starts at first base.) He finished third in the NL MVP voting. After the Mets finally overcame the Astros – the concluding Game Six was an excruciating 16-inning battle – they faced the Boston Red Sox in the World Series. Carter was 8 for 29 (.276) with 9 RBIs. He cracked two homers in Game Four at Fenway Park as the Mets tied the Series. Yet his most crucial hit came three days later, in Game Six. Carter’s single in the bottom of the 10th sparked the most improbable two-out, three-run rally that snatched the championship away from Boston. In 2012, teammate Bob Ojeda said, “If you watch the video with Gary walking to the plate, you see that sense of determination...in his step, in his swing. . .he was not going to make that out. You can see [it] in his face.”32 Carter told reporters exactly the same thing after the game. According to first base coach Bill Robinson, when Carter reached base, he let loose a rare expletive –“No f***ing way” – to intensify the statement.33 (Carter is credited with coining the euphemism “f-bomb” in 1988.34) It’s also noteworthy that he had donned his catcher’s gear, ready to play another extra inning, when the winning run scored on the ball that got by Bill Buckner. That spring, Davey Johnson also made Carter a co-captain of the Mets. In 2012, Johnson said, “I had a captain of the team – Keith Hernandez, he ran the infield – before Gary got there, but after seeing what he did, he was so special, I made him a co-captain. It was an honor he deserved.”36 The drop-off continued, however: even though Carter still started 116 games behind the plate, his basic batting line fell off to .242-11-46. His caught stealing percentage also hit a career low of 19%. He was 6 for 27 in his final postseason activity, as the Mets lost the NLCS to the Los Angeles Dodgers. In January 1990, he signed as a free agent with the San Francisco Giants. He platooned with another veteran, Terry Kennedy, who had been with the Giants during their pennant-winning season in 1989. Nonetheless, he still had the desire to play every day and didn’t want to hang on if he wasn’t contributing.38 Indeed, he made a respectable comeback (.254-9-27 in 92 games). Even so, Carter became a free agent again, and did not sign with another team until March 1991. This time it was the Dodgers, the team he had followed as a boy. He made good on a non-roster invitation from manager Tommy Lasorda and backed up Mike Scioscia. When Scioscia was sidelined by a broken hand, Carter played every game for two straight weeks, including both ends of a doubleheader against the Braves. He did another creditable job (.246-6-26, while throwing out 32% of base stealers). Carter did not file for free agency after the 1991 season, and the Dodgers placed him on waivers. As a result, he returned to Montreal in 1992 for his final year as a big-leaguer. He said it was something he’d always had in the back of his mind.40 At age 38, his teammates still called him “The Kid.” As it developed, he played more than any other catcher for the Expos that year, and though he didn’t hit much (.218-5-29 in 95 games), he still helped the team rebound from sixth place to second in the NL East. Carter went over the 2,000 mark in games caught and the 1,200 mark in RBIs in 1992, both milestones he wanted to achieve. Off the field, Carter’s strong character manifested itself again in 1995, when the Internal Revenue Service began investigating active and retired ballplayers for failing to report income earned from appearances and autograph signings at baseball card shows. Under the microscope were Met stars Darryl Strawberry, Lenny Dykstra, Hernandez, Darling, and Carter. But when the IRS subpoenaed Carter to appear before a grand jury, they found that he was as honest about his taxes as everything else in his life. Carter spent $25,000 in accountants’ fees to produce his invoices and receipts. When he left the witness stand and the courtroom, he said, “There was nothing the US Attorney’s office was ever going to be able to question me about.”46 Carter was swiftly dropped from the probe. On another front, the Gary Carter Foundation began operations in 2000. Its mission, through its own donations and funds raised externally, is to better the physical, mental and spiritual well-being of children in addition to supporting faith-based initiatives. Among the endeavors it supports is the Autism Project of Palm Beach County, Florida. The Carter family made its home there for many years. Carter was also disappointed not to have landed a coaching job with the Mets’ major-league squad – he wanted to bring his experience and inspiration. He hinted that it might have helped as the club folded down the stretch in 2007.54 As it developed, he took all of 2007 off. In 2008, though, he returned to managing with the Orange County Flyers (based in Fullerton) of the Golden Baseball League. That March Carter again voiced his desire to manage the Mets, while Willie Randolph still held the job.55 He stayed in Orange County and again was named Manager of the Year. For the 2009 season, Carter was skipper of another independent team, the Long Island Ducks of the Atlantic League. After his year with the Ducks, he became head baseball coach at Palm Beach Atlantic University in Florida. That was near his home in Palm Beach Gardens. Carter joined his daughter Kimmy, who had been a star catcher in softball at Florida State University from 1999 through 2002. She was named head softball coach at PBA in 2007. In May 2011, Carter began to experience headaches and forgetfulness. He was diagnosed with glioblastoma, an aggressive form of brain cancer. His case was inoperable, but he fought it with a course of radiation and chemotherapy, displaying the same positive outlook and competitive fire as always. Kimmy chronicled the grueling battle in an extensive journal on the website CaringBridge.org. The account was filled with hope and faith, which continued even after a magnetic resonance imaging scan showed the presence of several new spots on Carter’s brain in January 2012. Carter’s assistants had taken over his coaching duties at Palm Beach Atlantic, but he visited his team on February 2, 2012, when it opened its season in Jupiter, Florida, against Lynn University. It was his last public appearance – two weeks later, he died in hospice care. He was survived by his wife, three children, and three grandchildren. The Expos retired Carter’s uniform No. 8 in 1993, and it retains that status with the Washington Nationals (which the Expos became after the 2004 season). There have been frequent calls for the Mets to do likewise. In May 2013, the city of Montreal renamed a section of a street – adjacent to Jarry Park – Rue Gary-Carter. The following month, it inaugurated Gary Carter Stadium in Ahuntsic Park. A crowd of old Expos diehards greeted Gary’s widow Sandy and daughter Christy, who emphasized how much Montreal meant to the Carter family. Thanks to Christy Carter Kearce for her input. Continued thanks to David H. Lippman for his input during peer review. Billy Staples and Rich Herschlag, Before the Glory, Deerfield Beach, Florida: Health Communications, Inc., 2007. Gary Carter and Phil Pepe, Still A Kid At Heart, Chicago, Illinois: Triumph Books, 2008. 1 Tim Kurkjian, “This ‘Kid’ had a passion for the game,” ESPN.com, February 16, 2012. 3 Jim Murray, “He’s Hunkered Down and Worthy of Being the MVP,” Los Angeles Times, September 12, 1985. 5 Ron Fimrite, “His Enthusiasm Is Catching,” Sports Illustrated, April 4, 1983. Ian MacDonald, “Gary Carter finding his niche,” Montreal Gazette, October 7, 1977, 17. 6 Ian MacDonald, “Carter Winning Universal Acclaim for Canadian Progress Program,” The Sporting News, June 9, 1979, 3. 7 Andy O’Brien, “The Bubble Gum Kid,” Windsor (Ontario) Star, May 3, 1975. 8 “Montreal’s ‘The Kid’ tabbed baseball’s best,” Associated Press, May 9, 1981. Richard Goldstein, “Gary Carter, Star Catcher Who Helped Mets to Series Title, Dies at 57,” New York Times, February 16, 2012. 9 Jeff Pearlman, The Bad Guys Won, New York: HarperCollins Publishers, 2004, 89, 91. 10 Ira Berkow, “Two Different Stars Find Same Reward,” New York Times, July 28, 2003. 11 Tim Burke, “‘Boc’ gets what he hoped for with trade to San Francisco.” Montreal Gazette, March 28, 1974, 35. 12 E-mail from Christy Carter Kearce to Rory Costello, October 15, 2013. 14 Thomas E. Van Hyning, Puerto Rico’s Winter League, Jefferson, North Carolina: McFarland & Co., 1995, 133. 16 Gary Carter and Phil Pepe, Still A Kid At Heart, Chicago, Illinois: Triumph Books, 2008, 22. 17 Bob Dunn, “Expos Place Carter, Parrish Under Lock and Key,” The Sporting News, November 30, 1974. Bob Dunn, Expos Searching for Spot to Play Prospect Carter,” The Sporting News, March 15, 1975, 47. 18 Billy Staples and Rich Herschlag, Before the Glory, Deerfield Beach, Florida: Health Communications, Inc., 2007, 164. 20 Brad Willson, “Press Box,” Daytona Beach News-Journal, March 23, 1975, 1B, 7B. 21 Bob Dunn, “Docs Work Overtime Repairing Expo Cripples,” The Sporting News, June 26, 1976, 25. Mangual suffered a concussion. 23 Tim Kurkjian, “Congrats to The Kid,” ESPN The Magazine, January 7, 2003. 26 “Expos’ Chairman Claims Club’s Signing of Carter a Mistake,” United Press International, September 27, 1983. 27 Terry Scott, “Carter cleans out his Expos locker, sheds a few goodbye tears,” Ottawa Citizen, December 20, 1984. 28 Carter and Pepe, Still A Kid At Heart, 39. 30 Patrick Reddington, “Hall of Fame Catcher Gary Carter on the Washington Nationals, Montreal Expos and Tim Raines,” federalbaseball.com, August 11, 2010. 31 Dave Anderson, “‘I’m Not an .050 Hitter’,” New York Times, October 15, 1986. 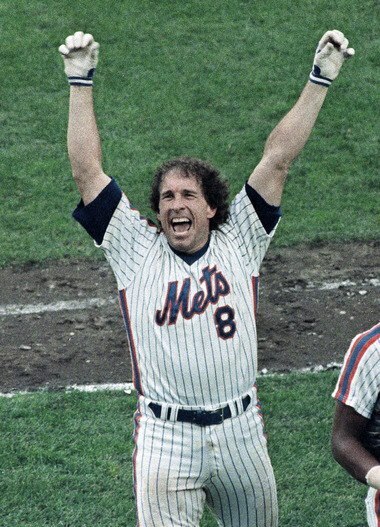 32 Steven Marcus, “Gary Carter sparked Game 6 rally in 1986,” Newsday, February 16, 2012. 34 Merriam-Webster’s Collegiate Dictionary (2012 edition) gave this article as the earliest known usage: Steve Marcus, “Carter Thrives as Pinch-Hitter,” Newsday, August 11, 1988. See also David Haglund, “Did Gary Carter Invent the ‘F-Bomb’?”, slate.com, August 14, 2012. 35 Craig Davis, “Men Behind the Masks,” Palm Beach Sun-Sentinel, March 3, 1988. 37 Ronald Blum, “Carter, Hernandez released by Mets,” Associated Press, October 4, 1989. 38 Erik K. Lief, “Gary Carter adjusts to new role,” United Press International, May 12, 1990. 39 E-mail from Robert Montgomery to Rory Costello, November 14, 2014. 40 Joe Gromelski, “For Gary Carter, there’s no place like Montreal,” Lewiston (Maine) Sun-Journal, May 11, 1992, 25. 41 Steve Rosenbloom, “Gary Carter: Our guy catches up to ‘The Kid’,” Chicago Tribune, August 31, 2004, Sports-8. 42 Scott Tolley, “Marlins Let Randolph, Carter Go,” Palm Beach Post, October 2, 1996. 43 “Carter has managerial ambitions,” Kitchener (Ontario) Record, March 21, 1998, E4. 44 “Kid Glad to Be back,” New York Daily News, March 3, 2001. 45 “Carter back as roving minor league catching instructor,” MLB.com, December 13, 2002. “Gary Carter to manage St. Lucie Mets,” MLB.com, January 9, 2006. 46 Bob Klapisch, High and Tight, New York: Villard Books, 1996, 140-141. 47 Carter’s vote percentage started with 42% in 1998, dipped to 33%, and was still just 49% in 2000. He then gained momentum, rising to 65% and 73% before finally breaking through with 78%. 48 One voter, Jack O’Connell of the Hartford Courant, wrote about this – “Fisk, Carter: Why Not Kid in Hall?” – on December 29, 1999. 49 Kevin T. Czerwinski, Kid catches Cooperstown spotlight,” MLB.com, January 16, 2003. André Dawson and Tim Raines are the two other members of the Hall whose plaques show an Expos cap (though Dawson would have preferred to show the Chicago Cubs). 51 Kevin Kernan, “Kid Stays in the Picture – Carter Could Be Next Met Manager,” New York Post, July 4, 2004. 52 Michael Morrissey, “The Kid Makes His Pitch,” New York Post, September 11, 2004. 53 Eric Pfahler, “Gary Carter currently has no job offer from Mets organization,” TCPalm.com, December 14, 2006. 54 Adam Rubin and Nicholas Hirshon, “Gary Carter thinks he was missing piece for Mets in 2007 collapse,” New York Daily News, February 20, 2008. 55 Adam Rubin, “Gary Carter would love to take Shea reins as Mets manager,” New York Daily News, May 23, 2008.